Post Apocalyptic Series Heads #968. Ink drawing. D Dominick Lombardi’s series combines the destructive/creative approach of graffiti with the aesthetics of the tattoo. The works consist of a linear design painted over a completed, sometimes abandoned painting. They mark an end of one way of thinking and begin a new path of esthetic release. Tattooed Tokyo: a Combination of Factors, Prince Gallery, Copenhagen, Denmark, 2016. Urchins: Sculptures and Collaged Drawings by D. Dominick Lombardi, Project Space: Kim Foster Gallery, New York, NY, 2010. Hidden Worlds, Curator, David Gibson, University of Massachusetts Amherst, MA, 2010. The Post Apocalyptic Tattoo, Housatonic Museum of Art, Bridgeport, CT, 2009. The Graffoo, PGartventure, Larchmont, NY, 2009. Toyota VS Godzilla, Artlexis, Brookly, NY, 2008. The Post Apocalyptic Tattoo, Gallery Milieu, Tokyo, Japan, 2008. Graffoos & Tattoos, Curated By John Pollard, ADA Gallery, Richmond, VA, 2008. The Post Apocalyptic Tattoo: A Ten Year Survey of Art of D. Dominick Lombardi, Curated By Carol Kino, Blue Star Contemporary Art Center, San Antonio, TX, 2008. The Post Apocalyptic Tattoo & Graffoos, Van Brunt Gallery, Beacon, NY, 2007. The Post Apocalyptic Tattoo, Lunarbase Gallery, Williamsburg, Brooklyn, NY, 2005. After the Rain, Delaware Valley Arts Alliance, Narrowsburg, NY, 2003. Reverse Collage, Art/Ex Gallery, Stamford Museum, Stamford, CT, 1997. Sign Symbol Surrealism, Portico New York, Inc., New York, NY, 1990. Beaulah Land, New York, NY, 1986. Westbroadway Gallery, New York, NY, 1979. Group show, Lichtundfire, New York, NY, 2016. Shaky Ground, Lesley Heller Workspace, New York, NY, 2016. HEAD, Hampden Gallery, UMASS Amherst, Amherst, MA, 2015. A Tangled Web, Causey Contemporary, New York, NY, 2014.
kooky cutters: redefined realities, Curator, Soojung Hyun, Kook Prjects, New York, NY 2014. Recontextualizing the Found, Anya and Andrew Shiva Gallery, John Jay College of Criminal Justice, Curated by Bill Pangburn and Dr. Thalia , 2013. Particle Physical, Curator Tony Petracca, Kim Foster Gallery, New York, NY, 2013. Under the Influence: Comics, The Edith Altschul Lehman Gallery, Curated by Susan Hoeltzel, Bronx, NY, 2012. 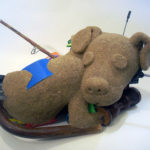 Toy Stories, Westport Arts Center, Helen Klisser During, Curator, Westport, CT, 2012. 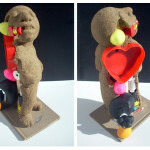 Monkey Spoon, Kim Foster Gallery, New York, NY 2011. Memory, Curator, Helen Klisser During, Westport Art Center, Westport, CT, 2010. One for the Road – a group show, curator, Carl Van Brunt, Van Brunt Gallery, Beacon, NY, 2010. Painting with Pictures, Curator, David Gibson,Casita Maria Art Gallery,Bronx, NY, 2010. 25th Anniversary Exhibition, Lehman College Art Gallery, Bronx, NY, 2010. Fresh Paint, Curator, Lynn Stein, Rockland center for the Arts, West Nyack, NY, 2010. Paper in the Wind 3, Curator, David Gibson, 532 Gallery Thomas Jaekel, New York, NY, 2009. Designing Intelligence? : Intelligent Design Project IV, FAU Galleries, Boca Raton, FL. 2009. Apocalyptic Pop, Curated by Kathleen Goncharov, The Dorsky Curatorial Program, Long Island City, NY, 2008. The Super Thing, a DEVO Inspired Art Show , 3RD WARD GALLERY – Brooklyn, NY, 2008. Deep Pop, Curated by Andrew Michael Ford, Kenneth Chapman Gallery, Iona College, New Rochelle, NY, 2008. Bridge Art Fair, with Van Brunt Gallery, Kasia Kay Art Projects and Bleu Acier, Miami, FL, 2007. Skin City: The Art of the Tattoo, Amanda Cooper, curator, The Arts Center, St. Petersburg, Fl, 2007. Intelligent Design Project III, Kasia Kay Art Projects, Chicago, Il, 2007. Intelligent Design Project II, Museum of New Art, Detroit, MI, 2007. In the Mix, Ann Street Gallery, Newburgh, NY, 2007. Singularity in the Communal Tide (Culture + Identity in the Moment), Baird Center’s Pierro Gallery, South Orange, NJ, (Curated by Rupert Ravens), accompanying catalog, 2007. Cursive 2, Art Commune, Curated by Thalia Vrachopoulos and Shin-yi Yang, Hong Kong, 2007. Red Dot Art Fair, Kasia Kay Art Projects, New York, NY, 2007. Intelligent Design Project, Silvermine Guild Galleries, New Canaan, CT, 2007. Scope Miami 2006 with Kasia Kay Art Projects, and Aqua Art Miami, Aqua Hotel with Lisa Boyle Gallery, Miami, FL, 2006. Strange Brew: Alejandra Villasmil and D. Dominick Lombardi, Repetti Gallery, L.I.C., NY,2006. Quantum Circus, SooVAC, Minneapolis, MN, 2006. Groovy, First Run, New York, NY, 2006.
the lab gallery, The Roger Smith Hotel, New York, NY, Scapes, 2006. Summer Gallery Exhibition, KKAP kasia kay art projects gallery, Chicago, Il, 2006. Kaleidoscope, The Basement Gallery, Knoxville, TN, 2006. Revisionist History; Getting the Story Straight, Dam/Stuhltrager Gallery, Brooklyn, NY, 2006. Paul Sharpe Contemporary Art, New York, NY 2006. Aqua Art Miami, Aqua Hotel, Lisa Boyle Gallery, Miami, FL, 2005. Me, Myself and My Emotions, Tastes Like Chicken Art Space, Brooklyn, NY, (curated by Rachel Phillips and Linda Dennis), 2005. Edgy and Elegant, The Arts Exchange, White Plains, NY, (curated by Rosemary Erpf), 2005. INKED!, Marshall Arts, Memphis, TN, (curated by Koan Jeff Baysa), 2005. INKED!, The Shore Institute of Contemporary Art (SICA), Long Branch, NJ, accompanying catalogue, 2005. Stray Show, Lisa Boyle Gallery, Chicago, Il, 2005. NOVA, Lunarbase Gallery, Chicago, IL, 2005. CIGE/China International Gallery Exposition, Broadway Gallery, Beijing, China, 2005. Link the World, Lunarbase Gallery, Williamsburg, Brooklyn, NY, 2005. Cursive, Tenri Cultural Institute of New York, New York, NY, accompanying catalogue, 2005. Characters, Scene 1 , The Shore Institute of Contemporary Art (SICA), Long Branch, NJ, accompanying catalogue, 2005. Characters, Scene II, Silvermine Guild Galleries, New Canaan, CT, accompanying catalogue, 2005. D. Dominick Lombardi and Ken Marchione, Branchville Gallery, Ridgefield, CT, 2005. Art Miami, Lunarbase gallery (Williamsburg), Miami, FL, 2005. Group Show, Lisa Boyle Gallery, Chicago, IL, 2004. Grand Opening Exhibition, The Shore Institute of Contemporary Art (SICA), Long Branch, NJ, 2004. Black & White: D. Dominick Lombardi, Lucio Pozzi, Ed Smith, Time and Space Ltd., Hudson, NY, 2004. Blast, Branchville Gallery, Ridgefield, CT, 2004. Lisa Boyle Gallery Chicago, Il, 2004. Painter’s Forms, The Workspace Gallery, New York, NY, curated by Nell Ogorzaly, 2003. Miraculous: Contemporary Exvotos Paintings, chez TGN, Brooklyn, NY, (curator: Trong Nguyen), 2003. People, Places, Things, dfn Gallery, New York, NY, 2003. Drawing Conclusions II, Broadway Gallery, New York, NY, (curators: Jill Connor & Gae Savannah), 2003. Drawing Conclusions: Work by Artist-Critics, NY Arts magazine gallery, New York, NY, (curated by Judy Collischan), traveling to: Berliner Kunstprojekt, Berlin, Germany, 2003. Characterism, Williamsburg Art & Historical Center, Brooklyn, NY, 2003. Six Approaches, Marist Art Gallery, Marist College, Poughkeepsie, NY, Curator: Donise English, 2002. Ketilhusid Museum, Akureyri, Iceland, traveling to: Pakkhusid, Olafsfjordur, Iceland; Hafnarborg Institute of Culture and Fine Art, Hafnarborg Museum, Hrafnarfurdor, Iceland, 2002. Reactions, Exit Art, New York, NY, traveling to: Alyce de Roulet Williamson Gallery, Pasadena, CA, 2002. Re-Figured, South Shore Art Center, Cohasset, MA, Curated by Salvatore Scalora, 2002. Metro-North: Abstract Painting from the Metropolitan New York Region, Schweinfurth Art Center, Auburn, NY, Curated by Kenise Barnes, 2001. Gallery Ofeigur, Reykjavk, Iceland, 2001. Summer Show, dfn Gallery, New York, NY, 2000. Best of the Art-Ex 95-2000, University of Connecticut Stamford Branch Gallery, Stamford, CT, 2000. Show Your Work: The Process Behind the Pieces, Pelham Art Center, Pelham, NY, 1999. ABSOLUT SECRET New York, McKee Gallery, New York, NY, 1999. Art As Spectacle, Katonah Museum of Art, Katonah, (Thelma Golden, Curator/Director of Branches, Whitney Museum of American Art), NY, 1998. Interstate I95, John Slade Ely House, New Haven, CT, 1998. New Art Annual, Stamford Museum, Stamford, CT, (Ann Philbin, Director, The Drawing Center, New York, NY), 1997. Assemblage: More Than Meets The Eye, Pace University Gallery/Choate House, Pleasantville, NY,1997. New Art Annual, Stamford Museum, Stamford, CT, (Jill Snyder, Director, Aldrich Museum of Contemporary Art, Ridgefield, CT), 1996. 31st Annual Open Exhibition, San Bernardino County Museum, Redlands, CA, (Elizabeth A. T. Smith, Curator, Museum of Contemporary Art, Los Angeles, CA), 1996. All-Of-A-Piece, Katonah Museum of Art, Katonah, NY, (Robert Storr, Curator of Painting and Sculpture, Museum of Modern Art, NY), 1995. 15th Annual Faber Birren Color Show, Stamford Museum, Stamford, CT, (Cora Rosevear, Curator, Museum of Modern Art), 1995. Nardin Galleries, Somers, NY, (curated by Philip Verre, Vivian Raynor and Edward Giobbi), 1995. Small Works International, Amos Eno Gallery, New York, NY, (curator: Jerry), 1994. Kunstraum, Cologne, Germany, 1994. Art Chicago International, Chicago, IL, 1993. Silpakorn University Art Gallery, Bangkok, Thailand, accompanying catalogue, 1993. Art Cologne, Intenationaler Kunstmarkt, Cologne, Germany, 1992. Gallery of Zhejiang Academy of Fine Arts, Hangzhou, China, 1992. Art Cologne, Intenationaler Kunstmarkt, Cologne, Germany, accompanying catalogue, 1991. Exhibition of Painting and Sculpture, Berkshire Museum, Pittsfield, MA, accompanying catalogue,(Jock Reynolds, Director, Addison Gallery of American Art, Andover, MD), 1991. Neo-Dada, Mid-Hudson Arts & Science Center, Poughkeepsie, NY, (curators Billy Name & Bob Pucci), 1991. Galex 24, Galesburg Civic Art Center, Galesburg, Il, Curated by Ann Nathan, 1991. Art Cologne, Intenationaler Kunstmarkt, Portico Gallery, Cologne, Germany, 1990. 75th Anniversary Exhibition (1915-1990), Hudson River Museum, Yonkers, NY, 1990. 14th Annual “small works,” 80 Washington Square East Gallery, New York, NY, (curator: Ivan C. Karp, Director, O.K. Harris Works of Art, New York, NY), 1990. Hudson Valley ‘89, Mid-Hudson Arts & Science Center/Barrett House, Poughkeepsie, NY, (curator: Frank Goodyear, Director, Pennsylvania Academy of Fine Arts, Philadelphia, PA), 1989. Hudson River Open, Hudson River Museum, Yonkers, NY, (curators: Susan & Liese Hilgeman,Assistant Director,The Hudson River Museum), 1989. Calgene Contemporary Fine Arts Competition, Natsoulas Novelozo Gallery, Davis, CA, (curators: Robert Arneson, Squeak Carnwath and Manuel Neri), 1989. Grass Roots Exhibition, Gallery at Hastings-on-Hudson, Hastings-on-Hudson, NY, 1988. Bridgewater/Lustberg Gallery, New York, NY, 1986. EV Gallery, New York, NY, 1986. Gambling Show, Public Image Gallery, New York, NY, 1986. Tar Beach, Native Sun, New York, NY, 1986. Tenth Anniversary Exhibition, Westbroadway Gallery, New York, NY, 1983. Westbroadway Gallery, New York, NY, 1982. Discovery ‘82, Bridge Gallery, White Plains, NY, 1982. -Bradley Rubenstein, High Anxiety, culturecatch.com, January 14, 2016. -Jeanne Wilkinson, New York’s Lesley Heller Workspace, ‘Shaky Ground’: Seeing Nature in New Ways, ARTES magazine, February 4, 2016. -John Paul Stapleton, Portraits Take It From The Top, artscope, November/December, 2015. -Jillian Burkett, A Head is not a Head, culturecatch.com, October 20, 2015. -Bradley Rubenstein, Tangled Up in Blue, culturecatch.com, January 13, 2015. -David Carbone, Holiday in the Sun… or on Mars!, culturecatch.com, January 8, 2014. -Jamie Martinez, HEAD Curated by Robert Curcio and D. Dominick Lombardi, ARTE FUSE, August 12th, 2013. -Michelina Docimo, Housatonic Museum of Art Exhibitis ‘Eye on the Storm,’ ARTES Magazine, July 26th, 2013. -Graham Kates, Art That Packs a Punch, Riverdale Press, February 9, 2012. -Alison B. Levy, Fuzzy Memory, culturecatch.com, July 25th, 2011. -Bradley Rubenstein, Crowds, culturecatch.com, December 16, 2010. -Jonathan Goodman, D. Dominick Lombardi: Central Galleries, Sculpture magazine, November, 2010. -Mary Hrbacek, Tattooed Tokyo by Dominick Lombardi, New York Art Beat, January, 2010. -Lauren Kaufman, Re-digesting Kitsch, NYARTSmagazine, April, 2009. -Michael Wilson, Apocalyptic Pop, Time Out New York, January 15-21, 2009, Art Review. -Mary Hrbacek, Apocalyptic Pop, the M magazine, February 2009, pp 22-23. -Matty Jankowski, Skin City – The Art of the Tattoo, Skin & Ink magazine, October, 2008. -Dan Goddard, Grotesquely charming mutants are artist’s glimpse into the future, San Antonio Express, February, 2008. -Jennifer Herrera, A little tattoo-art love, San Antonio Current, CURBLOG, Feb, 2008. -Elizabeth Stevens, VanBrunt Gallery, culturecatch.com, May 7, 2007. -Billie Waiteh, Kaleidoscope at The Basement Gallery, NYARTSmagazine, November, 2006. -Caryn Capotosto, Summer Group Exhibition, Flavor Pill, September, 2006. -Steven Psyllos, Blurred Vision: New Narrative Art, NYARTSmagazine, July/August, 2006, pp 117. -Douglas Michael, The Tao of Tattoos, The Record-Review, Bedford/Pound Ridge, NY, 1/6/06, pp. 15 & 16, Scarsdale Inquirer, January 6, 2006, pp. 13 & 15. -Ben Davis, A Future Present, artnet.com, 6/7/05. -Jill Conner, Dominick Lombardi: “The Post Apocalyptic Tattoo,” NYARTSmagazine, July/Aug‘05, pp. 63. -Rieko Fujinami, Poetry and Thought, No.227, Vol. 3, March 2005, pp. 74. -Germaine Keller, review of “The Artist’s Lament,” ZING, Issue #20, November, 2005 pp. 311 – 312. -Rodney Dickson, Artist 2 Artist, NYARTSmagazine, May/June, 2005, pp 69. -L. P. Streifeld, Restoring the Character Balance at Silvermine, The Advocate & Greenwich Time, April 3, 2005, pp. D3 – D4. -L. P. Streifeld, Transformation or Death at Branchville Gallery, The Advocate & Greenwich Time, January 9, 2005, pp. D3-D4. -Claire Lieberman, All Is Not What It Seems, d’ART International, Fall/Winter, 2004. -L. P. Streifeld, New Gallery Opens with a Blast, The Advocate & Greenwich Time, 6/6/04, pp. D3 D4. -Maureen Mullarkey, November, In & Out Of Town: Watercolor at the New York Studio School; Drawings at Marist College, Studio Matters: Notes and Commentary, November, 2002. -Katherine Gass, Re-Figured, South Shore Art Center, Art New England, September 2002. -William Zimmer, Form, Color and More from 25 Artists, The New York Times, 8/13/00, pp. 17 (ct). -Shadi Sheybani, Full Bellies vs. Fat Hips –‘Obsession (food)’ at Art Center, Women’s News, May, 1998, pp. 19. -Vivien Raynor, Show With Images of Food, but Not for the Hungry, The New York Times, 4/6/98, pp. 20(we). -Georgette Gouveia, The Art of the Meal, Gannett Newspapers, April 9, 1998, pp. 1C. -William Zimmer, The 20th Century, Two Viewpoints in Sculpture and Collage, The New York Times, January 18, 1998, pp. 18 (ct). -Vivien Raynor, Professionals Dominate in Show With Outsiders at Pace Gallery, The New York Times, April 6, 1997, pp. 18 (wc). -Vivien Raynor, A Show Celebrating Icons, But Not Just Figural or Sacred, The New York Times, 12/22/96, pp. 12 (wc). -Roberta Hershenson, The Role Slides Play in Judging Art, The New York Times, 9/30/90 pp. 19 (wc). -Helen Ganz Spiro, Triple Celebration Held at the Museum, Gannett Newspapers, 9/11/90 pp. 3C. -Kathie Beals, Shades of Dada, Gannett Newspapers, (March 26, 1989) pp. 5F. -E. C. Lipton, “A Different Satire,” Art Speak, (May 16, 1986) pp. 1. -Kathie Beals, Lombardi’s New Style: Pushing Paint Around, Gannett Newspapers, 2/1/85 pp. 9C. -Helen Steiner, On People, Westchester Spotlight, (December 1983) pp. 33 -Paul Kiefer, Westbroadway Gallery Celebrates its Tenth Year, Art Speak, (June 9, 1983) pp. 8. -Vernita Nemec, Disturbing Images, Art Speak, (June 24, 1982) pp. 3. -Kathie Beals, Tuckahoe Artist Moving on to Lighter Things, Gannett Newspapers, (10/2/81) pp. 11C. -Kathie Beals, New Galleries Restoring Fine Arts Concept, Gannett Newspapers, (June 22, 1979) pp. 7D. -Don Gray & Jessie Benton Gray, Reviews, New York Arts Journal, (February 1979) pp. 35.